Common Terns nest in colonies. The sheer number of birds packed together offer some protection to both the adult birds at the most vulnerable point in their lives and to the young. 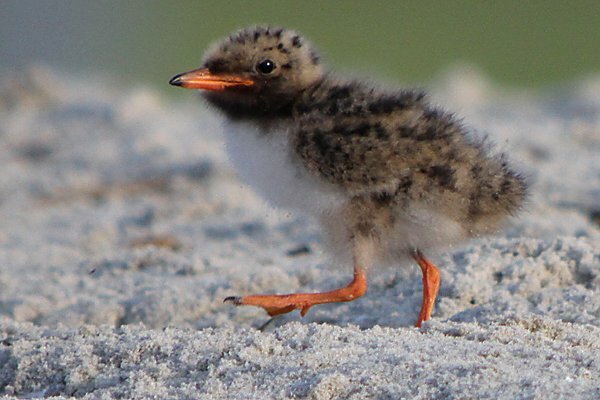 Any predator that shows up will be dive-bombed by a host of terns all defending their own nest and offspring but collectively protecting the colony. 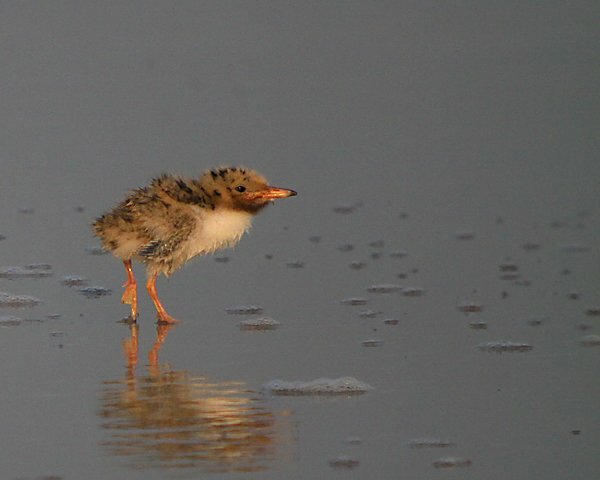 A young tern that can not yet fly is thus well-advised to stay within the friendly confines of its native colony under the protective shield of adult supervision. 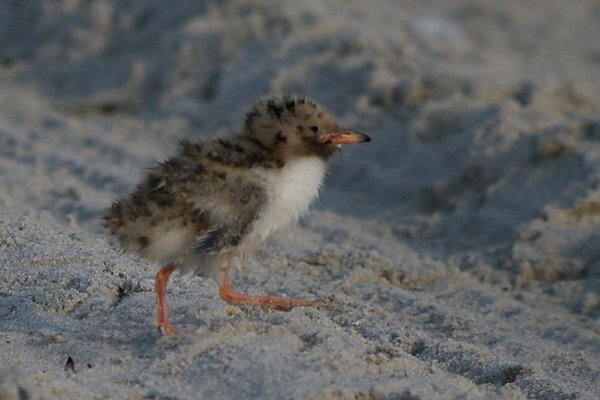 You can imagine my surprise then, when on a recent visit to a tern colony on the south shore of Long Island I observed a downy Common Tern chick making its way from its colony to the edge of the ocean, fifty or so meters away from the colony. An anomaly, I thought, a bird that is doomed to become gull food. To my astonishment, the bird made it to the water’s edge, drank, was buffeted by a small wave, got wet, pecked at things on the surface of the water, and then walked back to its colony unscathed. Once I realized that one tern managed the voyage without negative consequences I started to wonder if others did the same. And sure enough I spotted a couple of other downy chicks make their way to the water and back, to say nothing of a variety of slightly older birds. 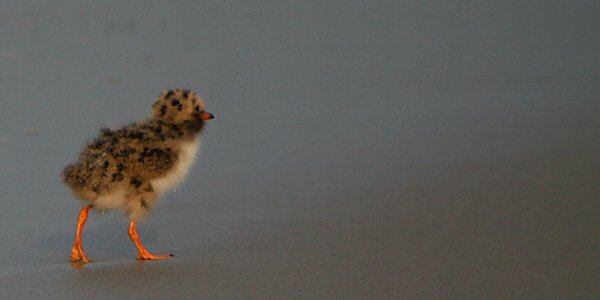 This started me thinking both about why the chicks would take such a risky stroll and why they didn’t get gobbled up by gulls, of which there were several species loafing about on the beach. Why did the chicks make their way to the water and back? I think the number one reason is heat. This was during the horrible heat wave that hit the central and eastern United States and it was very warm on the beach, even when I was there early in the morning before the heat of the midday sun. Getting to the water and cooling off is what people do and I imagine in the nearly shadeless colony the young terns get very hot waiting around for a parent to bring them a snack. Staying cool could be a matter of life or death for a downy youngster that is not yet able to regulate its own body heat. A second reason for the walks that occurred to me is practice at hunting. Each chick I saw get to the water’s edge pecked at things on the surface, an activity I associated with learning how to hunt. 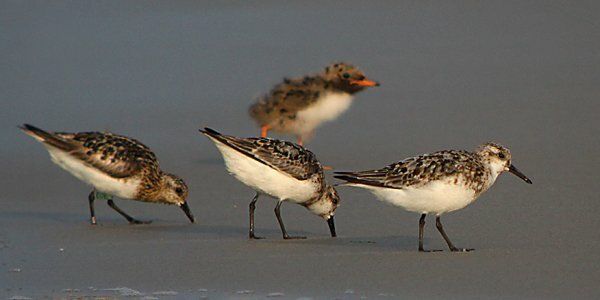 Finally, the walk to the water and back is likely the longest stroll the chicks would take before fledging so it might serve as a strength-building regimen. As for surviving what could have been a gauntlet of gulls, I think that the presence of both Black Skimmers, which also nest in the colony, and adult Common Terns bathing and preening at the waterfront gave the chicks a level of protection that might be missing between the colony and the ocean most of the time. Only one gull even approached a tern chick, and it was merely a Ring-billed Gull that was quickly escorted away by a Common Tern that continued out over the waves to hunt once the gull was driven away from the youngster. 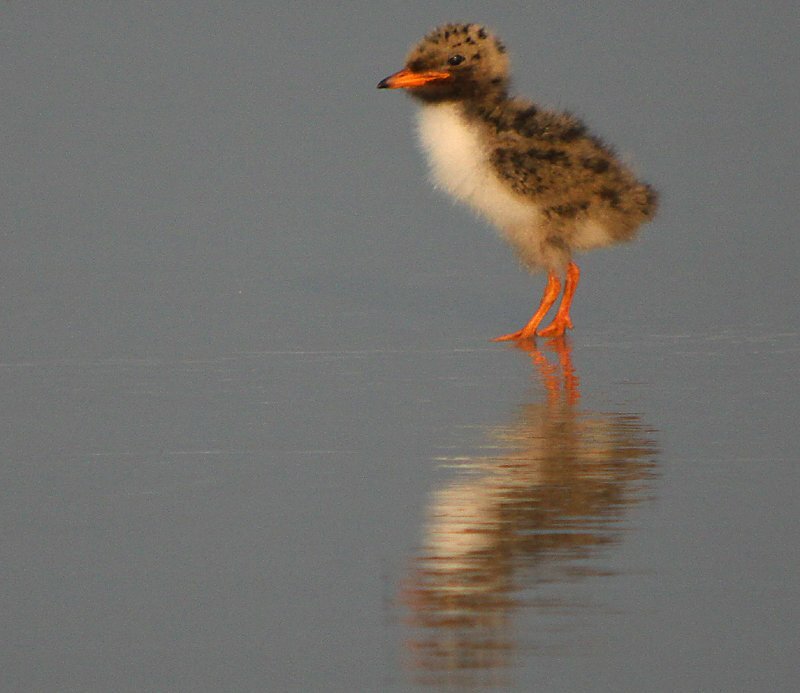 I don’t think the tern was even a parent to the chick it protected. Whatever the reason for the chicks’ walking to the water and back it was fun to watch and photograph. Here’s hoping you enjoy these bespeckled little cuties as much as I do! All images were taken with my digiscoping rig while maintaining a respectful distance because the birds come first. 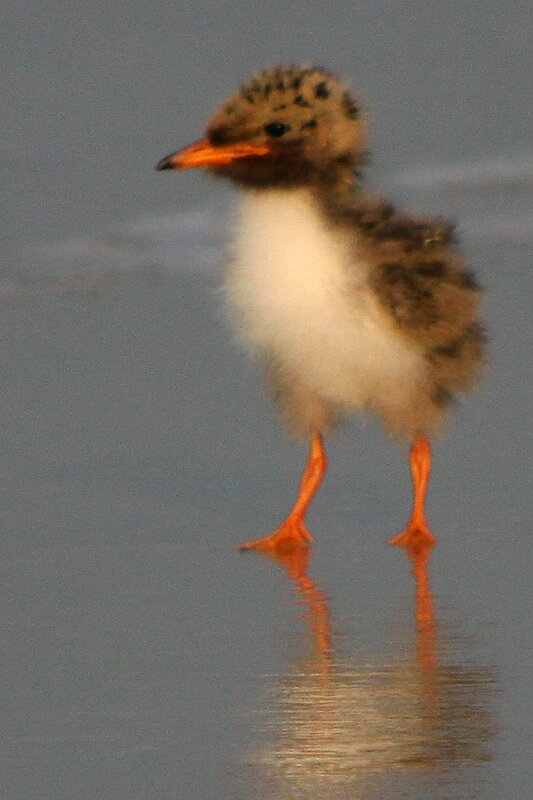 Okay, I see I have to ramp up the cute baby bird photos. Game on. Seriously, real nice photos Corey. @Clare: Oh, yes, the game is on…and thanks! @Jochen: You know what is really nice? 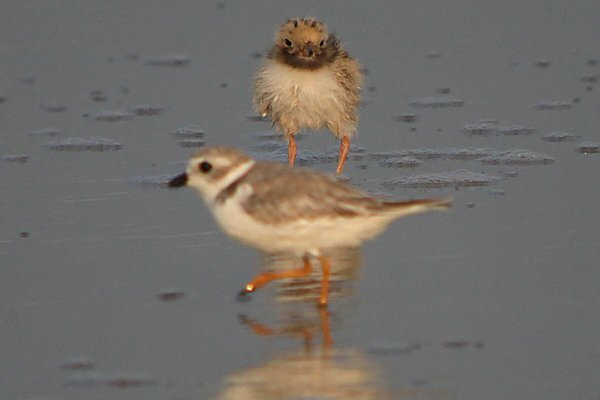 Baby Piping Plovers! We saw the very same thing in Bristol Bay, AK at our fish camp years ago. 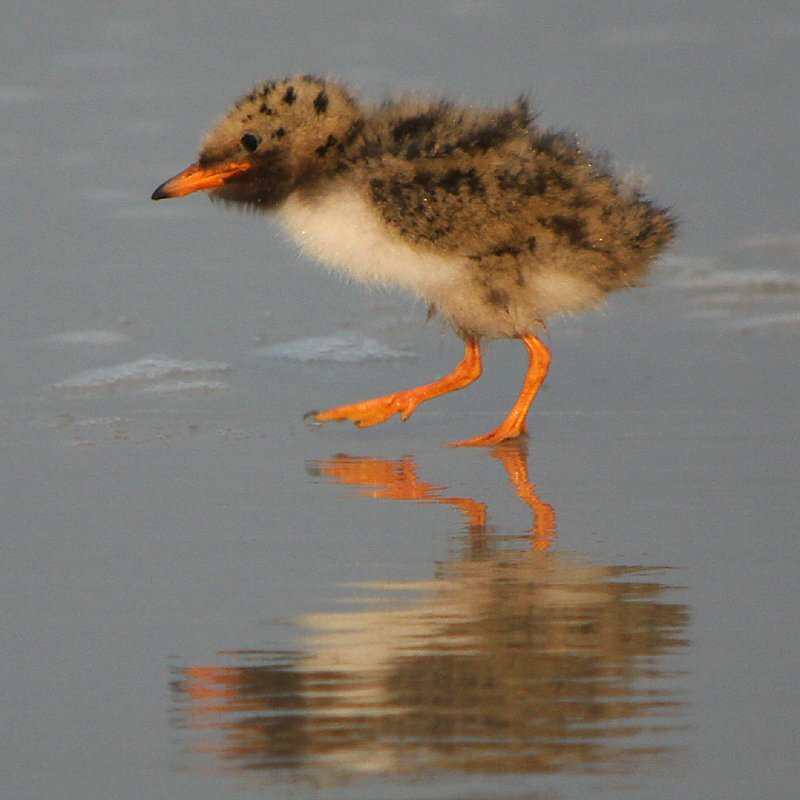 We were right next to a small arctic tern colony and noticed a baby had walked to the creek about 100 yards away. It jumped in and swam across to the other side. It was high tide and we were all in a panic over this, but eventually it swam back across and made it back to its parents. As I recall it was a warm sunny day! Unfortunately, about a week later a fox ate it. 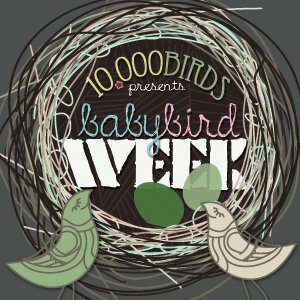 If that was really Corey’s Mom who wrote that her son’s post about a baby bird was cute, well, I’d have to call that meta-cute.